Julia Cameron has made a life out of morning pages, those three pages of brain dump that she encourages everyone to do every morning without fail. 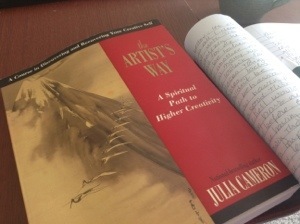 In The Artist’s Wayshe starts her journey, to be followed by many more books on the same theme. This first book is rich. It is deep and thoughtful and effective. I haven’t looked at it for years, actually gave it away, until a friend of mine started it recently and I had to go out and buy another copy. There’s something about the practices of those morning pages, the artist’s date, the examination and thought about creativity that makes you do a bit of growing inside. I recommend it highly to people who are feeling blocked, or uncreative, or sad. It will tow your thoughts to a more expansive location, allow you to feel the joy of creation again, lift your sails. (Marine analogy courtesy of looking out my window at the ocean). I’m glad I bought a fresh new copy, with none of my old thoughts littering up the pages. I’m different than I was ten or so years ago, my goals are different, the things flying out of my head are different. Love your beach analogies! And I agree about writing every morning. But what, where and why you write is up to you.